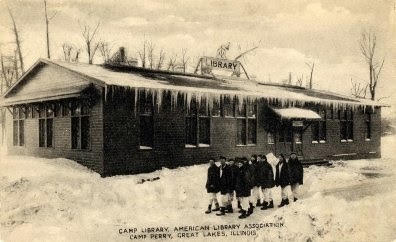 One of the kinds of library postcards that I collect is postcards depicting bookmobiles. This postcard showing a 1948 Gerstenslager bookmobile for the Greene County (OH) Public Library is a Real Photo Postcard (RPPC). RPPCs showing bookmobiles are unusual so I was happy to add this one to my collection. 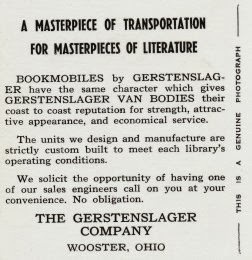 It is also unusual in that it was used as a promotional piece for the Gerstenslager Company's bookmobiles. I've written a previous post about these Gerstenslager postcard advertisements. The Greene County Public Library continues to operate a bookmobile. There are lots of images of bookmobiles on the Web. One of the best sites for these images is the Pinterest bookmobile site of the American Libraries magazine. 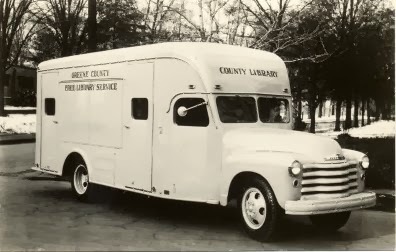 I have a tribute to bookmobiles on the Library History Buff website. I also compiled a list of the best bookmobile websites. I recently added another library ticket (shown here) to my collection of vintage library cards. It is for the Young Men's Mercantile Library Association of Cincinnati and it was issued to D. J. Fallis in January, 1868. I've written a previous post about the Cincinnati Mercantile Library which continues to exist today. There is a very interesting story about its facility which is provided rent free in a multi-story building in downtown Cincinnati. Library cards were called library tickets in some early libraries. 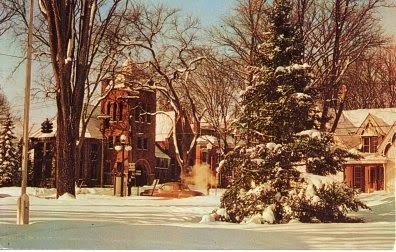 I recently acquired the postcard shown above which has another library winter scene (see other library winter scenes). 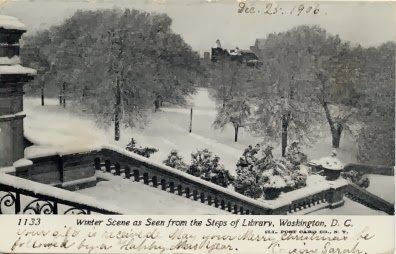 It is a scene from the steps of the Library of Congress, and it was mailed on December 25, 1906. The message reads: "Your gift is received. May your Merry Christmas be followed by a Happy New Year." My sentiments exactly. The two lions that grace the entrance to the New York Public Library on 5th Avenue are world famous. In 2000 the United Postal Service was set to issue a stamp to pay the pre-sorted first class postage rate that featured one of the lions without reference to the NYPL. However, the lion image is trademarked by the NYPL, and the USPS was required to identify the New York Public Library on the stamp. Among the postal librariana items that I collect are first day covers and postal uses of the NYPL lion stamp. 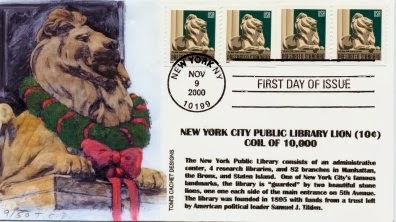 One of the first day covers (shown above) has a cachet (illustration) by Tom's Cachet Designs which features one of the lions with a Christmas wreath around its neck. I thought this would be an appropriate item to feature on the blog at this time of the year. Season's greetings to all! 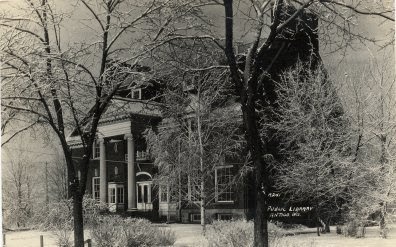 Today is the first day of Winter, and we're expecting a big snow storm later today here in Wisconsin. 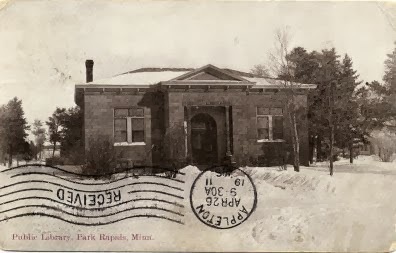 Postcards depicting libraries in the Winter are unusual. Below are four from my collection. To see others click HERE.